I'm looking for someone to be the site's official blogger, their role will be to post new content to the front page of the site that is in keeping with the site's ethos (no peril) you will gain a special rank on the forum. Anyone can apply just leave a message here and I'll get back in touch. Fats - I know you said "someone" but are you looking for a couple people or just a single person? I think if it was a couple/few you might get more diverse content and less pressure to be the only source - but at the same time a bit of gamification. it can be one or a team of bloggers, I have no preference on that. On the powers, the user(s) will be a made a site editor, which has a lot more powers like the ability to edit stories (woodclaw will kill me for telling you that), the ability to upload pics to the server and a new role on the forum. You will have access to a dedicated link for posting content to the blog, without admin approval, also if needed I can set you up with a @superwomenmania.com email address, other features will be added as and when needed. fats wrote: it can be one or a team of bloggers, I have no preference on that. erikphandel wrote: What kind of abilities would this person potentially have to have? That said, I am fantasising about a girl with super edit powers: "I'll tweak your text and there's NOTHING you can do about it! Your puny weapons are no match for my exemption from admin approval." Personally, I'm too unreliable, not to mention way too niche in interests to apply. I'm with Random: I really think a team of bloggers, with different expertises and styles is the way to go forwards. I'm going to wait for a little while longer to see who else is up for it. I'm interested in writing a blog entry from time to time, as part of a team. It would be great to see different perspectives represented in the blog. I know I struggle to keep things on my page fresh but it's amazing what just something once a week does for fan interaction. I would be very happy to be part of a rotating team. Will this become like wikisuperwomanpedia? I've allowed this idea to fall by the wayside so I wanted to check that the people still wanted to be the site's bloggers and if there is anyone else who is up for the role please reply to this thread. I'll be setting the role up this week. 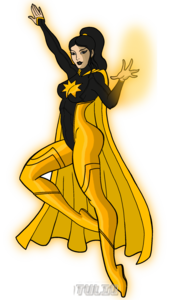 I wanted to bump this up because in another thread it was asked if there were other forums for general superheroine fans ~ while there are some others I don't think there is a place that has a bigger draw and our focus. The forum posting volume and webpage features are the best they've been and the library has great content and seems to be getting fresh content more often than it used to. That's even with some of the discord channel fragmentation. I'm sure we've all also felt some fragmentation as perhaps show/movie specific sites and social media draw traffic. I don't see that lasting forever and I think we'd be wise to keep the front page a little more refreshed to help capture those fleeting new searches and eyes as the MSM high water mark perhaps recedes over the next year or two. I think it's very important we foster the community and keep things as fresh as possible. We can even keep it simple ~ things in our own forum sometimes rise to being front page worthy: I thought Fred9101's thread on costumes vs civies was great and totally front page poll and post worthy. Last edit: 02 Apr 2019 16:39 by Random321. Random321 wrote: I think it's very important we foster the community and keep things as fresh as possible. We can even keep it simple ~ things in our own forum sometimes rise to being front page worthy: I thought Fred9101's thread on costumes vs civies was great and totally front page poll and post worthy. Thanks Random, really appreciate. Its cool to see the popularity of this thread. Random321 wrote: I wanted to bump this up because in another thread it was asked if there were other forums for general superheroine fans ~ while there are some others I don't think there is a place that has a bigger draw and our focus. Hi Random - off topic, but who is that lovely creature as your avatar? Thanks! Bionicskillz: That's Bella ~ a new PSW model. If you've not stopped by the PSW webpage blog lately consider taking a look. You can see (or download no charge ~ link at the bottom) 16 full res images from our photo shoot. Off topic thought/request: Love to see Bella (the PSW Mindy Marvel redhead) lift a building or truck...(this can be video or photomanip).